this picture just shows one of my other hobbies, namely playing role playing games, in this case d&d. it shows the most important things i need to play these games. a miniature (i am not a good painter, so it's not painted), a pencil, some dice, and, of course, the character sheet. 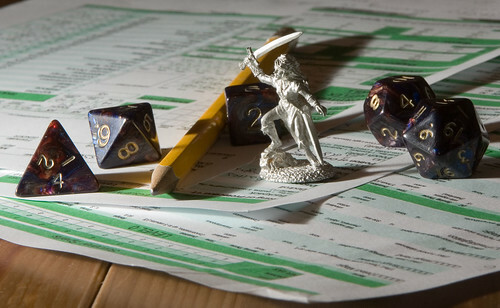 i've spent a lot of time in my life playing role playing games and i stell continue to enjoy it. if you prefer a wider angle, you can have look here, but the other picture also has a little different shadowing.